Now that summer sun is in full swing and the kids are out of school it’s time to make sure we as parents and caregivers are doing everything we can to protect them from the sun’s damaging rays while allowing them to still enjoy the great outdoors. I know that my kid’s summers were always jam-packed with activities from swim club to day camps and softball games. We could hardly catch a breath. Daycare providers, coaches and camp counselors do their best to ensure the safety of our children and that includes applying sunscreen. But with all the commotion that goes on with a group of rambunctious kids, it’s easy to see how remembering to re-apply at the proper time could get over-looked. Sunglasses and hats will give additional protection as well. When shopping for sunglasses, there are two important factors. First, choose a pair that not only wraps tightly around the face so that harmful UV rays do not burn your child’s eyes and peri-ocular skin. 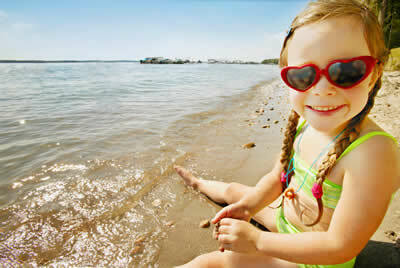 Second, sunglasses with a protective UV rating of 400 will block approximately 99% of the sun’s ever harmful rays. Remember baseball caps only provide coverage for one side of the head / neck. This leaves your child’s ears, neck, chest, shoulders and the sides of his or her face exposed. To provide good protection look for a wide-brim hat with a brim that is 3inches or more. Trying to choose the sunscreen that will best protect your child is where it gets a little tricky. It can feel like you need a Ph.D. in “sunscreenology.” There are so many choices that most parents just simply look for the one with the highest SPF on the label. Unfortunately that can be misleading. We like to share with our patients that the most important qualifier is choosing a good sunscreen is to look for two ”physical sunscreen” ingredients; titanium dioxide and zinc oxide. Once you have the right sunscreen, apply it liberally! And then re-apply it – liberally! Don’t be afraid to talk with your coaches, camp staff and daycare providers about your sun exposure concerns, and ways they can help protect your child. It is important to recognize that sun damage is cumulative. What does that mean for an unprotected child? Well the amount of UV radiation they a child is exposed to from the day they are born until present impacts his or her risk of developing a skin cancer and pre-mature aging. Both of which are preventable with education and the proper development of sun protection habits.